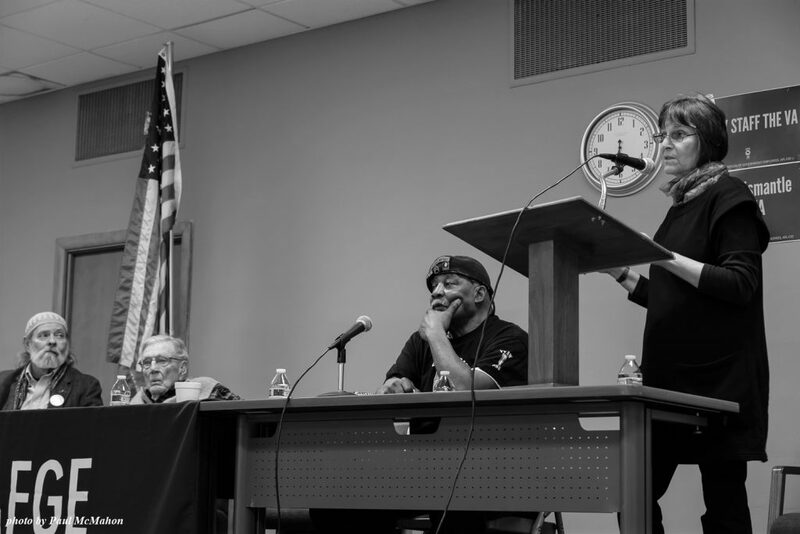 VFP members Larry Orr, Lincoln Grahlfs, and Will Williams listen to Suzanne Gordon present at the Madison VA.
Perspective at the meeting was presented by Suzanne Gordon. Gordon is an American journalist and author who writes about healthcare delivery and health care systems and patient safety and nursing. She is author, co-author or editor of 18 books. She is currently working on a book about the innovations and clinical care at the Veterans Health Administration. VFP members Lincoln Grahlfs, Larry Orr and Will Williams all spoke and testified about their excellent treatment at VA facilities. Ms. Gordon urged all present to contact Senators Baldwin, Johnson and their representative (Mark Pocan) to counter the privatization moves. Thanks to all who participated and helped us be better informed. Thank you especially to the American Federation of Government Employes for sponsoring this session and for some of this edited text. This entry was posted in Department of Veterans Affairs, VA, Veterans Administration and tagged AFGE, Clarence Kailin Chapter, Department of Veterans Affairs, Larry Orr, Lincoln Grahlfs, Suzanne Gordon, VA, VA Privatization Efforts, VA whistleblowers, Veterans Affairs, Veterans for Peace, Veterans Health Administration, VFP, WIll WIlliams on March 6, 2018 by Website Administrator.